According to a study in the Wildlife Society Bulletin, every year 573,000 birds (including 83,000 raptors) and 888,000 bats are killed by wind turbines – 30 percent higher than the federal government estimated in 2009, due mainly to increasing wind power capacity across the nation. And this is likely an underestimate because these numbers are based on the data from 2012 when there were fewer wind turbines. In 2010, a Mother Jones Blog estimated about 800,000 birds died because of the British Petroleum (BP) oil spill. As a result, they paid $100 million in fines for killing and harming migratory birds. – In 2009, Exxon Mobil paid $600,000 for killing 85 birds in five states. – PacifiCorp, which operates coal plants, paid more than $10.5 million for electrocuting 232 eagles that landed on power lines at its substations. – The first wind farms fines were imposed in November 2013 when Duke Energy paid a 41 million fine for killing 14 eagles and 149 other birds at two wind farms in Wyoming from 2009 to 2013. However, the nation’s wind turbines killed more than three times as many birds than BP oil spill over the past 5 years. 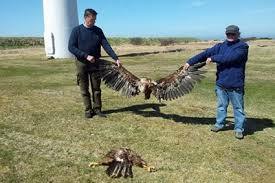 And, wind turbines routinely kill federally protected birds and eagles. The Ivanpah solar power plant, a 377 megawatt solar facility located in the Mojave Desert in California, is estimated to have killed 83 different species of birds. But, to date, no solar facilities have been fined. On December 9, 2013, the Obama Administration finalized a regulation allowing wind energy companies to obtain 30-year permits to kill eagles without prosecution by the federal government.